What is the primary function of a car radio? To enable you to listen to your choice of radio station. When I'm visiting blighty, my choice lies between 90 and 93 FM. Quite obviously, I want to tune my car radio to the station broadcasting in these frequencies. This used to be a simple, quick and obvious process. Regard this photo of a car radio. There's nothing special about it, it's chosen simply because it happens to be in a car I rented a couple of days ago. Radios in cars in blighty are much the same. You will see some digits. You will see no nine among those digits. I can't tune the radio to ninety anything. 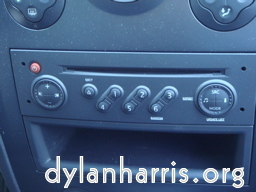 In fact, there is no mechanism to simply tune the radio to my chosen station. That's a design failure. The radio contains a mechanism to automatically scan through frequencies looking for stations. I press a button and the radio goes to the nearest station, up or down frequencies. I must do this repeatedly until the radio gets to the station I seek. This is, of course, a very inefficient way to find a specific station at a specific frequency. That's a second design failure, especially since the mechanism doesn't actually work. It goes straight past my chosen radio station, repeatedly. It will not tune to it. Given this station is national, is part of the BBC, is transmitting, the failure of the radio to tune is a fault in the radio. It turns out that the radio won't tune into weaker signals because the designers have confused good quality signal with good quality content; they put packaging before intelligence. I cannot tune a car radio into what is generally acknowledged to be the best radio network in the world. These are the third and fourth design failures. If I do settle on an alternative, and stop pressing the station seeker, the radio continues randomly changing stations anyway. It refuses to stick to the station it's been told to stick to. What is happening is that the radio is searching for a better quality transmission for the station, but doesn't find it because it isn't there. So it replaces music of imperfect quality sound with white noise. That's the fifth design failure. Once the radio has settled on a station, which, with luck, might have something in common with the station I want to hear, it doesn't stay there. At some point during the journey, when the station is still clear enough to appreciate, the radio will randomly try and retune itself again, interrupting a comprehensible broadcast. This does not happen between pieces of music. This does not happen between conversations. This does not happen when the station is no longer comprehensible. This does not happen when the radio is told to retune. It happens purely because the designers have presumed sound quality is more important that what's being transmitted. This attempt to seek a better transmission when there isn't one is the sixth design failure. The function of the radio is to tune to the listeners' chosen radio station. In general, car radios do not do so. The designers of these radios do not understand function. These radios have replaced an earlier generic design that enabled users to quickly select their chosen station. Those radios' failure was that they couldn't retune quickly when signal died as the car travelled. It took a driver all of a couple of seconds to retune it. Modern car radios have replaced that couple of seconds of forced manual retuning with a general failure to tune at all. As to why this has happened, and why so many radio manufacturers copy each others’ mistakes, I can only guess. I know the people who buy the radios, the car manufacturers, are not those who use them. I suspect laziness amongst radio manufacturers; after all, it’s much cheaper to copy something that doesn’t work than to design afresh if the car manufacturers will buy any old crap.